Audit Scotland said the Forth Replacement Crossing project – the biggest publicly funded infrastructure project in Scotland in recent years – delivered value for money, although a clearer plan is needed to measure its wider benefits. Auditor General Caroline Gardner found that the £1.34bn infrastructure scheme – which cost at least £110m less than expected - was managed effectively. She said: ‘There is much the public sector can learn from the way Transport Scotland managed the project and it's important that the good practice is shared more widely. He said that £245m had been ‘handed back to the Scottish budget’ by the project. Auditors said the final cost of £1.34bn was around 8–16% lower than the £1.45–£1.6bn estimated at the start of construction. Their report praises Transport Scotland's budgeting, governance, quality assurance and risk management - as well as the competitive tendering that helped deliver the project under budget. The principal contract was let for a fixed price of £790m. Although the new crossing opened eight months later than first estimated and 10 weeks later than the contract completion date of 16 June 2017, the report accepts that this was due to bad weather. Auditors said a key factor behind the project's success was that the delivery team had the right mix of skills and experience and demonstrated ‘strong, consistent leadership, and communicated well with contractors and stakeholder groups’. 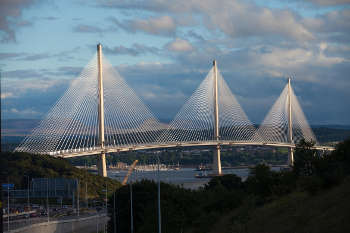 Going back to 2007, the report states that the Scottish Government identified a clear need for the bridge, and demonstrated that the preferred option - a cable-stayed bridge - had several advantages over other options and designs. However, auditors said it is too early for some of the project's wider benefits - such as improving public transport across the Forth, cutting journey times, and boosting economic growth - to be demonstrated and that ‘more detail is needed on how success will be measured’. Two key figures in the construction of the crossing were recognised in the Queen's Birthday Honours in June. Michael Martin, who was project director for Forth Crossing Bridge Contractors, was awarded an OBE, as was David John Climie, project director for Transport Scotland.